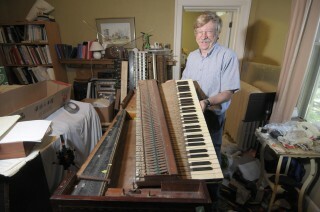 John Hall, curator of the Canadian Piano Museum in Napanee, with the fortepiano. Photo by James Park. Marie (“Let them eat cake”) had one. So did Russia’s Catherine the Great and England’s Queen Charlotte. And now, thanks to Carleton University, Chamberfest fans can hear one – a 1777 Frederick Beck Square Fortepiano, that is.